Just complete the online entry form or send us the Little Guy’s location in the mail. We accept one entry per person per week. That gives you four (sometimes five) chances to win the monthly Find the little Guy prize. One winner will be randomly selected the last day of every month. 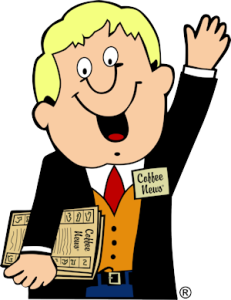 Pick up a copy of the Coffee News® today.